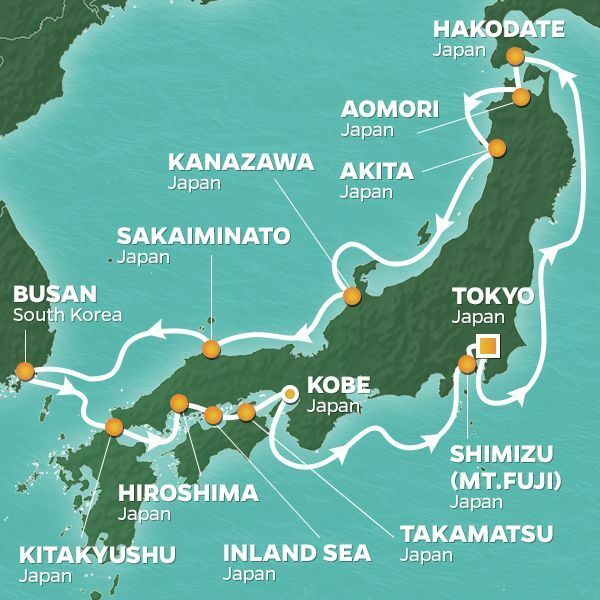 Dive deep into Japan, from feudal Samurai towns to tech-driven Tokyo, as you circumnavigate the country with stops at every major port. This voyage has eight maiden calls including less-traveled Hakodate, one of Japan's first treaty ports in 1854, and Akita, which has been inhabited for thousands of years. Samurai fans will want to visit the ruins of Akita castle (from 733 AD) and Kubota Castle, where a defeated warrior once lived. Another noteworthy stop is the small fishing port of Sakaiminato, known for crab, Bluefin tuna and fertile farmlands. From here you can visit Honshu's ancient shrines and Bronze Age burial mounds, but above all you'll want to see Matsue Castle, one of Japan's few remaining feudal castles. Throughout this voyage you can join small-group experiences to learn about Japan's culture and traditions. Become a mini-expert in Shinto shrines, Buddhist temples, Japanese architecture, bonsai, origami, geisha, or the etiquette of sushi. Of course you'll dine like a king on incredible seafood, Kobe beef, ramen, shabu-shabu, tonkatsu and more. And you'll be surrounded by gorgeous scenery too, from perfectly tended national forests and gardens to beautiful coastal bays and towering snow-capped peaks.